That's just what Sophie thinks as she researches three facts about polar bears for a school assignment. After all, what can you say other than that they're big, they're mean and they eat things? Well, it turns out there's a lot more to polar bears than that, as Olafur — the rather large polar bear who suddenly appears in Sophie's house and then whisks her away to the Arctic — is determined to show her. Initially, Sophie is quite unimpressed with the vast expanse of ice and snow that is Olafur's home. But then he points out the other inhabitants: the birds, seals, foxes and snow rabbits. She listens to whale music, discovers moss-covered rocks that look like mice and slides down glaciers. Then, as day turns to night, she watches the spectacular display that is the Northern Lights, or Aurora Borealis. As we return to Sophie's home, we see that she now has pages of notes on polar bears prepared for her homework assignment, full of detailed drawings and amazing facts. 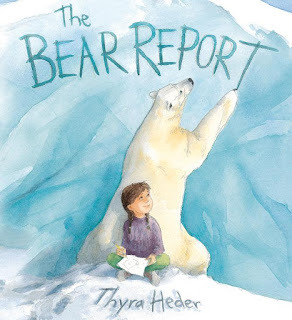 This story was inspired by Thyra Heder's own visit to the Arctic, and her subsequent desire to showcase the beauty of the landscape and its inhabitants. However, The Bear Report also reveals the power of curiosity to enrich our lives, whether tackling homework or embarking on Arctic exploration. I love how Heder brings animals to life on the page — a talent also evident in her first book, Fraidyzoo (see review here). Olafur is a wonderful ambassador for the Arctic and will hopefully encourage youngsters to find out more about his home and the environmental challenges polar bears face. But even if he just inspires a more enthusiastic approach to homework, he'll have done a good job!